It may be covered by varying types of face plate. These need to be removed before any testing can be done. Your service provider will always ask you to check your phone or broadband at this point and will not send an engineer until you have performed these checks. Cant find your master socket ? Follow the wire from the outside - from the pole follow the wire to where it enters the building - or the wire comes up from the ground into the grey capping then into the nearest socket usually just the other side of the wall . 70s houses the wire came up in the cavity termiated behind the TIS plate (plain square white blank plate with square hole in the middle) then onwards usually onto the master socket. More style over substance. If mounted side by side you cannot squeeze the tags on the side to open them. No tools required ! Squeese the tags on the sides and remove cover to reveal the test socket. Removing the front disconnects the customers (your) wiring. LJ3/1A Old style Master socket large. These old type master sockets do not have an easy way to disconnect the extentions. Which you need to do before any testing can be done. LJ2/1A Old style master socket small. 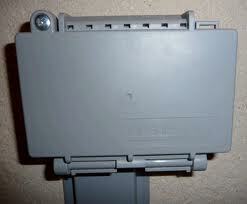 Here are two types of Broadband filter face plates added onto a NTE5 . Same principal applies just remove the two screws until you are left with the test socket exposed, as shown at the top. This the BT infinity face plate added on to a standard NTE5. Although these look different they do the same job as any other face plate . Thats why BT use them to achieve the high speeds of Infinity. Unfortunately BT will only install them directly on the existing NTE5 where ever that may be. Even if its no where near your usual modem routers location. Leaving you or me with a cabling job. Here is the iplate added onto the NTE5 . These work slightly different to the above, and when tested head to head are not nearly as good as a face plate. Fairly nasty. They are a work round - rather than fix the under lying problem. From Dec 2008 for a while BT started installing External NTEs on some new build properties. 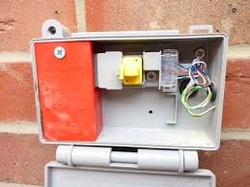 The box is located on the exterior of the premises allowing BT Openreach Engineers easy access for testing etc and are clearly marked "Wiring and equipment from this point belongs to the property owner. Where Openreach attend for a reported fault and determine that the fault is beyond this point the visit and any work will be chargeable." ​ BT appear to be connecting these new units internally to LJU's (non NTE5 sockets) which unfortunately means that there is no internal test socket for the customer. 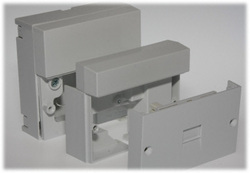 For testing purposes the External NTE unit contains a yellow plug ( lightning protector) which can be removed to disconnect the customer owned wiring. Sometimes the lightning protector its self goes faulty. 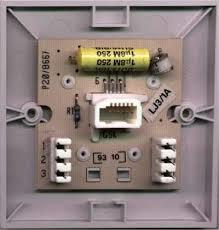 ​ Inside the grey NTE is a red tamper proof unit where the BT's wire terminates. End users (you or your electrician) can connect to the see through portion on the right. The terminals are IDC - Insulation Displacment Connector (as in dont strip the wires) just lift the see through bit, shove the wires in and push it back down again) labeled 2, 3 & 5. 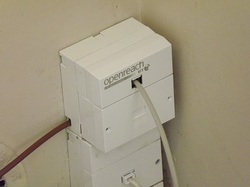 If you have broadband the bell circuit or number 3 wire (usually orange/with white fleck) can be left unconnected in order to reduce interference on adsl enabled lines. A good idea at the time. 2003 - 2004 Pre Broadband ish. Slightly deeper than the standard NTE5 Looks like it has a back box when no back box is present. By sending a signal that was a bit like Broadband - the complex electronics inside temporarily disconnected the customers wiring. This enabled BT to test the line without having to send an engineer to remove the face plate. HAVE YOU SPOTTED THE FATAL FLAW YET ? - Broadband makes your phone line and broadband cut of randomly rendering it completely useless in the modern world. Did BT recall them ? No chance. The right hand doesn't know what the left is doing. They wouldn't have a clue where or if they had them. Another simple reliable device that worked perfectly - ruined by putting a computer in to it. The box is just a place to join the incoming fibre to the outgoing fibre. The clever bit is inside the house shown. Presumably the analogue telephone will fed from TEL1 (and Tel2 if you have 2nd line). The battery backup (Right) is destined to kick in if there is a power outage (would be a problem if you couldn't make 999 calls in an emergency!). Tel 1 will effectively be your test socket.